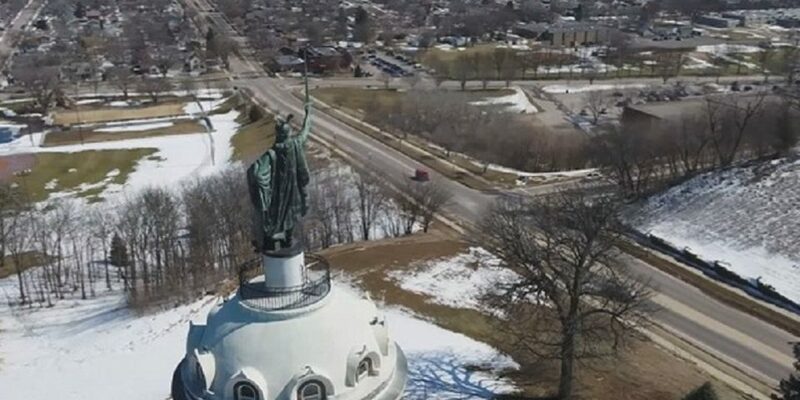 Undoubtedly, the biggest historical events in New Ulm’s history were the battles that engulfed the young town in August of 1862 during the US-Dakota War. Pushed onto reservations since 1851 and forced to change their lifestyle from hunters to farmers, cheated by some unscrupulous traders, and starving from a poor harvest and delayed annual payments for their land, the Dakota Indians tried to take back their lands, aware that the government was distracted with the Civil War down south. There were seven major battles in the Minnesota River Valley, with two direct attacks on New Ulm on August 19th and 23rd. 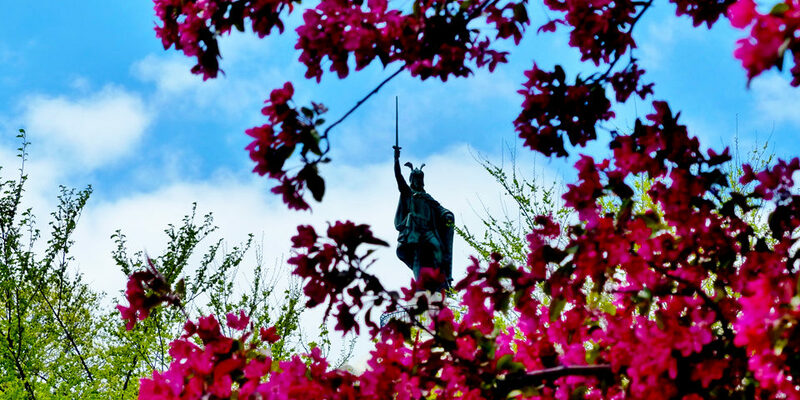 By the time of the second battle, there were over 2,000 terrified settlers in a 3-block “island of defense” in downtown New Ulm. With the help of a timely thunderstorm and reinforcements from neighboring towns, the net result was that the Indians were repulsed but the town and many surrounding farms were devastated by fire. After a short evacuation, most of the hardy settlers came back to rebuild their town with renewed vigor. It would have been easy to give up but we have their tenacity and desire for a new life to thank for the town we live in today. 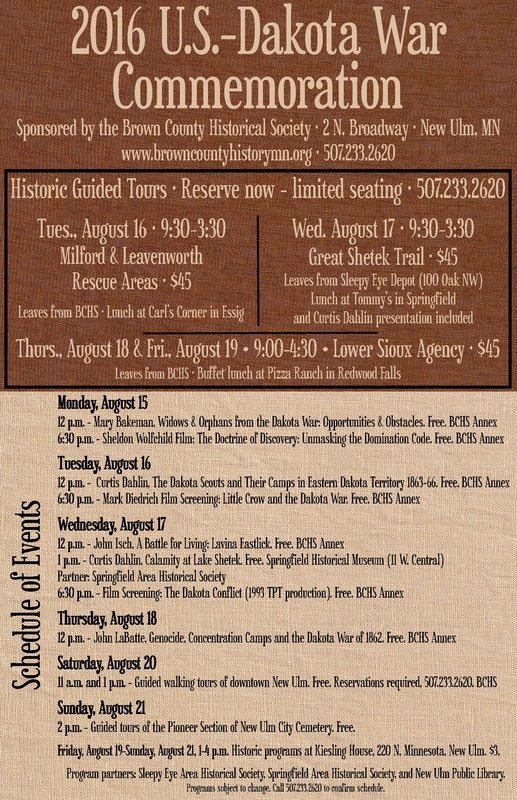 During the week of August 15-21, the Brown County Historical Society will host a series of events (seminars, film screenings, historic tours, and more!) commemorating the US-Dakota War of 1862. See a list of these events here, or learn more about them here. The Significance and Magnitude of the U. S. – Dakota War of 1862, according to author and historian Curtis Dahlin. If it were to take place today and the same proportion of people were killed, there would be over 15,000 dead. The over 600 who were killed compares with 615 battlefield deaths of Minnesota Civil War soldiers. One difference is that the soldiers were armed whereas most of those killed in the U. S. – Dakota War were unarmed, and a second difference is that the Civil War deaths were spread out over a 4 year period while most of the U. S. – Dakota War victims were killed within a 6 week period, between August 17 and September 23, 1862. When looking at a daily toll of victims, there were over 200 killed on August 18, 1862, in the U.S. – Dakota War, whereas there were about 235 soldiers killed with General George Custer at the Battle of the Little Big Horn on June 25, 1876. One difference is that the soldiers were armed. The over 600 victims were the largest number killed in the nation in a war with the Indians. In response to this, 38 Dakota were hanged at Mankato on December 26, 1862, the largest number of people executed at one time in the nation. The August 22, 1862 battle at Fort Ridgely was the largest attack on a fort by the Indians, with about 800 Dakota attacking the fort in which there were over 400 people, most of whom were unarmed refugees fleeing the Dakota. The August 23, 1862 battle at New Ulm was the largest attack on a town, with about 650 Dakota attacking the town containing about 2,000 people, most of whom were unarmed. The August 25, 1862 evacuation of New Ulm – some 2,000 people – was the largest number of people to completely evacuate a town during an Indian war. An estimated 20,000 people fled their homes, which was the most in any Indian war in the nation. About 400 victims lie in unmarked and unknown graves, the most in any Indian war in the nation. Learn more about the US-Dakota War of 1862 here.